Being compliant with OSHA regulations for warehouse is crucial when it comes to avoiding devastating fines and legalities for your business. However, compliance is just as important and relevant to the safety of your warehouse, and can make the difference between the occurrence of preventable accidents and the elimination of serious injuries, equipment damage, and deaths. If you’re not sure of OSHA warehouse standards, don’t take chances with your safety. From employees (better career prospects and greater on-the-job confidence) to employers (reduced liability, better productivity, etc. ), our training is beneficial for everyone involved with OSHA warehouse safety guidelines. Let’s take a detailed look at OSHA warehouse safety guidelines impact your distribution center. Why Does My Warehouse Need to be OSHA Compliant? There are more than 7,000 warehouses in the United States employing more than 140,000 individuals. The rate of fatal injuries due to accidents in the warehouse industry is higher than the national average for all industries. The Occupational Health and Safety Administration (OSHA) is responsible for the implementation of workplace health and safety regulations in the USA. This agency has the power to levy fines as high as $30,000 to employers for willful or repeated violations of OSHA regulations for a warehouse. When it comes to being compliant and preventing accidents in your warehouse, you need to take certain precautions and follow our tips for OSHA warehouse safety. Since OSHA warehouse standards are subject to changes – updated rules and regulations are common with OSHA – you need a training program that’ll keep you on top of OSHA warehouse safety guidelines. What are the Major Hazards in the Warehouse Industry? Warehouse safety relies on workers being aware of their surroundings and being prepared to respond to hazards that arise. OSHA regulations for warehouse address the varying dangers that can affect the safety of workers. Forklifts, slips and falls, and falling objects are some of the top most dangerous hazards in warehouses. They each contribute to serious injuries and fatalities every year, but can be avoided with the right knowledge and training. Forklifts cause a significant number of deaths and serious injuries on workplaces every year, with numbers totaling up to about 70% of serious injuries. Workers on and near forklifts can be struck by, thrown from, and crushed by forklifts when the proper safety precautions have not been taken. Slips and falls are high-occurring hazards in warehouses that cause major injuries. Unsafe areas in a warehouse can contribute to slips and falls, but they often result from workers not having the proper training. A falling object from forklifts and shelves in warehouses is another top warehouse hazard. Falling objects can seriously injure or kill workers when they aren’t properly cared for on a forklift or haven’t been properly handled and stacked. – Unsafe operation of forklifts: Operators learn how to properly drive forklifts when they complete training and receive their forklift certification. This is one of the most common OSHA warehouse safety violations. – Injuries owing to repetitive motion: Repetitive motion injuries from lifting, reaching, pushing, and pulling inside of a warehouse are often the result of poor ergonomics. Training can teach workers how to properly handle tasks on the job and avoid strenuous activities. – Inadequate provision for fire safety: Fire hazards are always something to be mindful of. Certain operational practices along with proper worker safety equipment can help prevent fire-related accidents and injuries. – Improper product stacking: Stacking products improperly in a warehouse can not only affect the efficiency of a warehouse but also the safety of the workers. Improper product stacking can lead to unstable products that become crushing hazards. – Failure to use protective clothing and equipment: Personal protective clothing and equipment protects workers from many types of hazards, including respiratory, impact and crushing hazards. One of the most commonly cited violations in warehouses is the lack of respiratory protection for workers. Many post-accident investigations involve this aspect of OSHA warehouse safety guidelines. There are many different aspects of OSHA warehouse safety guidelines. Some OSHA regulations directly impact warehouse operations, while others aren’t as obvious. The key is to find a training partner that keeps you ahead of the curve with OSHA warehouse safety guidelines. One way you can do this is with our Train a Trainer program, which helps your warehouse stay up-to-date with aerial lift and scissor lift standards – with this course, you’ll have your own OSHA-approved resource to help other workers improve their safety practices on a daily basis! Warehouses present a wide range of hazards for employees who operate large equipment and those who handle materials on foot. Among the top ten most frequently cited OSHA regulations for warehouse is the violation of the agency’s forklift standard, coming in at number one. OSHA’s forklift standard covers both the safe operation of the forklift and the safety of the work environment. It addresses fuel handling and storage, charging and storing batteries, the control of noxious gases and fumes, and operator training. Since it is such a common violation, it’s clear that workers are not being properly trained to operate forklifts. – Hazard communication: This standard addresses chemical hazards and the communication of these hazards to workers. – Electrical wiring methods: The standard covers the grounding of electrical equipment, wiring, and insulation. It includes temporary wiring and splicing. – Electrical system design: This one covers the general safety requirements for designing electrical systems. – Guarding floor and wall openings and holes: Properly protecting workers from hazards from floor and wall openings and holes is what this standard addresses. – Exits: This standard addresses the importance of establishing exits for workers in the case of an emergency. – Mechanical power transmission: This standard covers all the types and shapes of power-transmission belts. – Respiratory protection: The respiratory protection standard addresses the establishment or maintenance of respiratory protection problems. It lists the requirements for program administration, worksite precautions, respirator product selection, worker training, and testing for respiratory hazards. – Lockout/Tagout: This standard outlines the minimum performance requirements for the control of hazardous energy during servicing and maintenance of machines and equipment. – Portable fire extinguishers: The requirements of this section apply to the placement, use, maintenance, and testing of portable fire extinguishers. For more information on each of the areas of OSHA warehouse safety, the various hazards associated with each, and how to avoid them, read OSHA’s Worker Safety Series Warehousing guide. How Can I Make Sure My Warehouse is Compliant with OSHA Standards Regarding Forklifts? Nearly 100 employees are killed and 95,000 injured each year in accidents involving forklifts. A significant percentage of these fatalities are caused by forklift turnover. Seven out of ten forklift deaths involve people between the ages of 25 and 54. With forklifts being such a top concern for warehouse workers, OSHA warehouse safety starts with learning how to work with and around forklifts safely. Below are some suggestions for keeping your warehouse compliant with OSHA regulations for warehouse regarding forklifts. – Forklift trucks should be inspected daily for any condition that might adversely affect the safety of the vehicle. Vehicles should be clean and free from grease, lint, or excess oil. If at any time a powered industrial truck is found to be in need of repair or in any way unsafe, it should be removed from service immediately. – No one under the age of 18 should be allowed to drive a forklift truck. 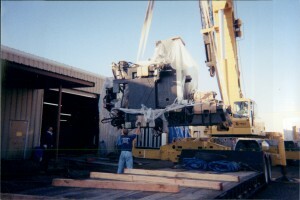 – Safe procedures should be followed for stacking, picking up or putting down loads. – All forklift operators should be trained, evaluated and certified to ensure they can safely operate the equipment. 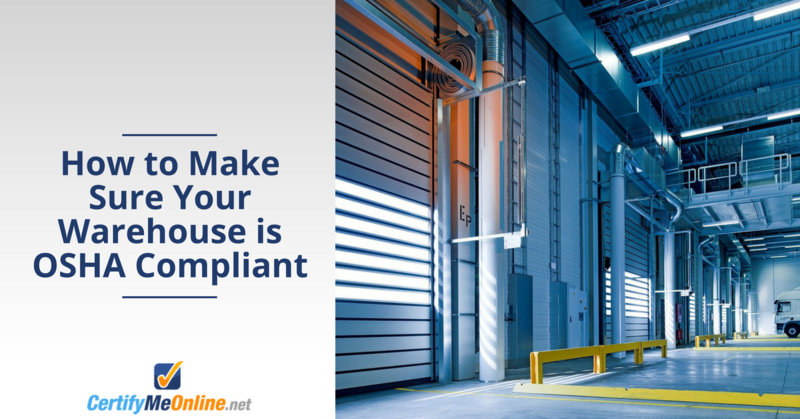 In addition to following the OSHA regulations for warehouse, there are also some general guidelines you can follow to keep your workplace safe. Keep your workplace safe from warehouse accidents and be compliant with all OSHA regulations for warehouse with the training courses from CMO. CertifyMeOnline.net can help you train, evaluate and certify your scissor, aerial or forklift operators in as little as a few hours for less than $50 per employee. Skip the need for booking an expensive function room or sending your employees offsite for training. In only about one hour and from any device with an internet connection, workers can complete their training course and print their operator certification card. – Covers boom lifts, telescopic boom lifts, telehandlers, cherry pickers, scissor lifts, and rough terrain scissor lifts. Create an account today on the CMO website and be 100% compliant with OSHA regulations for warehouse! We can help with OSHA warehouse safety standards and other guidelines, so give us a call today at (602) 277-0615. Our online training courses keep everyone in your company up to speed with ever-changing OSHA warehouse standards. This post was originally published in 2013 and updated to include new information in 2018. This entry was posted in Aerial Lift Certification, Aerial Lift Training, Scissor Lift Training on August 27, 2013 by admin.